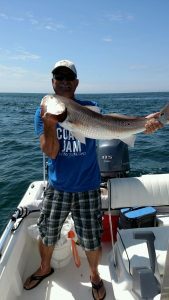 Located at the world famous Captain Anderson’s Marina, Able Fisherman Charters specializes in Panama City Fishing Charters with personalized service for up to six passengers aboard one of our two vessels. Captain Steve Paul and crew have over 30 years of local experience providing people just like you with memories of a lifetime. Whether in shore or off shore, there are a variety of species targeted depending on seasonal availability. We have several trips available for your enjoyment. Bait and tackle is furnished for your trip. Just bring your food and drink. PLEASE CALL FOR PRICING AND AVAILABILITY. Captain Steve started fishing at a young age locally just for recreation. In the later 70s, he started working as a deck hand on the local charter and party fishing boats. In 1983, he got his first captains license and in 1984 purchased his first charter boat. He has been active on the local fishing scene since that time. He has charter fished (offshore) and guide fished (inshore bays, etc.) extensively over the last 30 years. He has also been a freelance (hired) captain on several local charter boats and party fishing boats. With literally thousands of satisfied customers, he now offers personalized fishing for up to six passengers as well as freelance (for hire) captain services at reasonable rates.